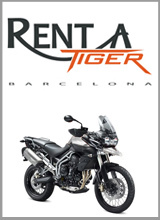 Because Motorcycle Riding is also a matter of sense and sensibility, we are now offering a new service aimed especially at those renting for long-distance trips and mountain roads riding: the chance to mount a new set of your favourite tyres on our Tigers to make them feel like your bike away from home. Feel confident while touring in the twisties, whether it's wet or dry. We've got special conditions for you... Ride Safe, Feel the Tiger! !